Hemingway. Your manly, mannish, macho prose always disturbed my feminine sensibilities. All that fishin', and bull fightin', and crocodile wrastlin' (ok, I made that last one up). Then I read A Moveable Feast and found out that you were just a big softy. Hemingway started A Moveable Feast in 1957, basing it on the journals he wrote in Paris in the 1920s before he hit the big time. He and his wife Hadley (and baby Bumby) lived in dirty, cold apartments scraping together enough money for a bottle or two of wine. Occasionally, they'd skip off to Switzerland to ski. In Paris, Hemingway met famous artists and writers. He has a lot to say about them. Sometimes it's sweet and sometimes (most of the time) it's gossipy. His pen is kind to those he really loved and harsh to ones he didn't. He talks about the books he read and the authors he admired. His life was books and writing. He paints a vivid picture of what it was like to be a struggling writer in Paris at that time. The cafés, the wine, the food, the arguments. There are funny stories and bittersweet stories. It felt sincere. The only thing that bothered me was near the end when he says 'the rich' came between him and Hadley 'using the oldest trick there is.' It didn't seem to me that he was taking any responsibility for his affair. It just happened. "Whoops! How did that get in there?" It did sound like he regretted hurting her though. 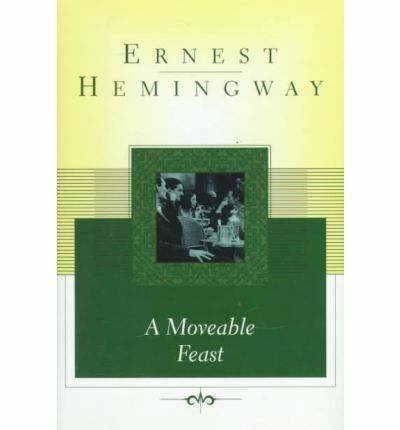 A Moveable Feast was published posthumously in 1964. His 4th wife Mary edited the 'original' edition. Recently, his grandson edited a 'restored' version. Whenever relatives are involved in a project like this, they are going to be accused of shenanigans. And both were for different reasons. While reading the original, I wondered if Hemingway had had the final say what the book would look like. So yes, through A Moveable Feast, I warmed up to Hemingway. A bit. We're not bffs or anything but we can hang out. I'm not so sure about hanging out with Hemingway. I'm afraid he might stab me in the back! I guess after drinking all that wine I wouldn't care:-). It is so funny to me that I love his writing even though I think he is a terrible writer. I have a stack of Hemingway to read thanks to this book. I guess his writing gives me hope:-). Great review. Amazing how some great work is published posthumously. I'm sure it's difficult for relatives to edit or revise their loved ones work. It has to be a daunting task. So glad you enjoyed this. It (and The Old Man and the Sea) are my favorites from Hemingway. 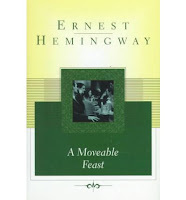 A Moveable Feast makes me want to visit Paris and read more Hemingway. I've never been a big Hemingway fan (he simple can't write a female character that isn't a simpering fool), but I read this one and fell in love with it. I had just gotten back from a trip to Paris at the time and that made it resonate even more. I generally agree about Hemingway's lousy attitude toward women. Then when I read the short story, "Hills Like White Elephants," my jaw dropped. In that story he actually, sensitively, took the woman's side of a difficult conflict. He never did it again, that I know of. I'm kind of embarrassed to admit that I've never read Hemingway - I'm sort of intimidated. I wonder if he was more forthcoming about how it got in there in the unedited version? Earth moving, etc. I really enjoyed this one. The fact that it was set mostly in Paris helped a lot. And I can totally see old Ernie wrastlin' gators. Kristy- Or write something nasty about you later in the cafe! I'm not ready for more of him yet but I'll give him a chance. Kelly- Ugh, grade 10 English. I didn't like it either. Lena- It would be tricky, that's for sure. Natalie- I was never a fan of The Old Man but this one was good. Melissa- You are right about the female characters. They drive me nuts. H.Lee- I will have to look for that one. I think I'd be shocked too! Kathy- He's surprisingly easy to read. Very short, non-descriptive sentences. He's almost terse. Heidenkind- Ha! Yeah, the relatives might not have appreciated that. Jill- Yes, the Paris setting was definitely in his favour. I'm with you - this book gave me a different perspective on Hemingway. I still don't know if I'll read any more of his fiction, but I'll gladly re-read this book. That scene with F. Scott Fitzgerald. Dang! I've been looking for a copy of this book everywhere, not because I think it's great work of literature but because I want to read all the gossipy tidbits. LOL. There's something about books like this that make almost-mythical writers like Hemingway seem truly human. have you read For Whom the Bell Tolls yet? Just curious. I liked it but I think maybe because I read it after A MOVEABLE FEAST when I was feeling much kinder to HEmingway. I just read this one a few months ago too and need to review it. I was surprised how gossipy it was. And yeah, take a little responsibility for your actions. No one coerced you into having an affair. And you let a cat babysit your child? Hmmmm. That said I LOVE For Whom the Bell Tolls. Although up to this point the rest of his books I've read are eh.